This ancient and distinguished surname, with several notable entries in the National Biography, may be either of Welsh or English (Norman) origin. As a Welsh surname Gower is locational from the Gower or Gwyr peninsula in West Glamorgan, Wales, and the first recording from this source is particularly early (see below). There is a further place called Gower north west of Eastry in Kent from which the name may also conceivably derive as surname recordings are particularly prevalent in 16th Century Church Registers of Kent and Surrey. John Gower was christened at Farnham, Surrey, on September 22nd 1552, and on June 9th 1591, Katherine Gower and Thomas Henshaw were married at Waldershare, Kent. There are three Norman origins for the modern surname Gower: the first of these is regional for someone who came from the district north of Paris, known in Old French as "Gohiere"; the second is locational from any of the various places in Northern France called Gouy (from the Gallo-Roman personal name "Gaudius", with the addition of the Anglo-Norman French suffix "-er"). Finally, Gower may derive from a Norman personal name "Go(h)ier", an adoption of the Old German "Godehar", composed of the elements "gode", good, and "heri, hari", army. 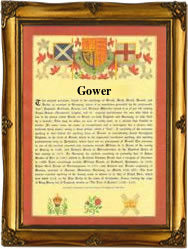 The surname Gower is borne by the Dukes of Sutherland and the Earls of Granville. George Gower was sergeant-painter to Queen Elizabeth in 1584. The first recorded spelling of the family name is shown to be that of Walter de Guher, which was dated 1130, in the "Pipe Rolls of Carmarthenshire", during the reign of King Henry 1, known as "The Lion of Justice", 1100 - 1135. Surnames became necessary when governments introduced personal taxation. In England this was known as Poll Tax. Throughout the centuries, surnames in every country have continued to "develop" often leading to astonishing variants of the original spelling.